BOB, the pavilion is the result of a pedagogical experiment involving graduate art and architecture students at Columbia University. Professors Galia Solomonoff (GSAPP), Nathan Carter (GSAPP), and Liam Gillick (SoA) engaged a team from the Graduate School of Architecture, Preservation, and Planning (GSAPP), and the School of the Arts (SoA) to produce a communal space. 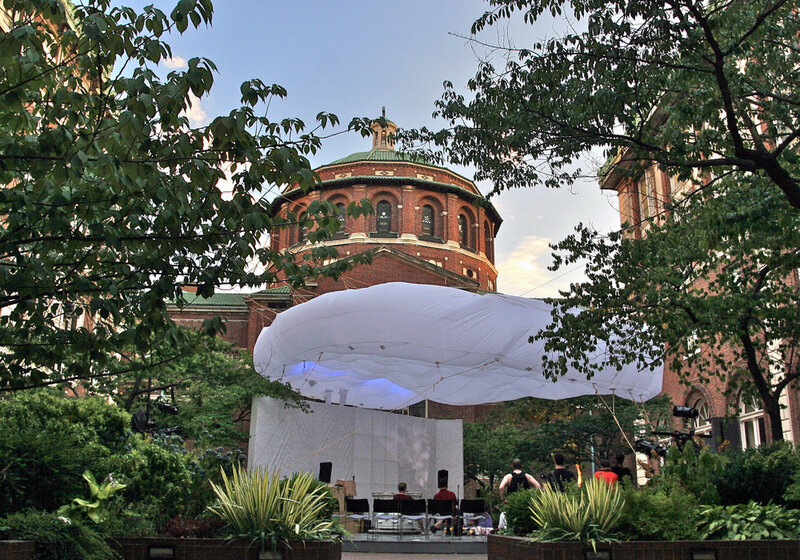 The outcome was an inflatable cloud above a public bathroom and forum that opened on June 1, and will operate until July 25, 2011. The pavilion is located in the courtyard behind Avery Hall, which houses Columbia’s architecture school.